Motorola's mobile phone strategy has been heading in a different direction for a while, but that hasn't stopped it copying Apple and seeing one if its flagship devices 'found' in a fleamarket. Unsurprisingly, it's Gizmodo that got the first pictures of the Motorola Olympus, which has been the subject of a few leaks recently. 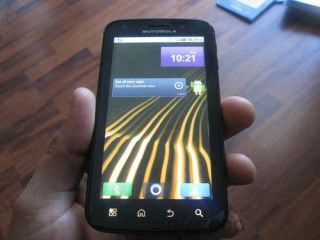 The phone is running Android 2.2, has an Nvidia Tegra 2 chip stuck inside and also brings a HDMI-out port as well. Some specs haven't been confirmed, with the screen size probably around 3.7- to 4-inch in size, as well as elements like on board storage. "[I] bought it not knowing it would power on. Apparently by holding volume down and power I was able to access a developers menu with a lot of features, one being a bypass activation screen. This is a pretty cool phone." With such leaking going on, we can only assume that the Motorola Olympus is coming soon - although whether it will get a UK release date is unknown.